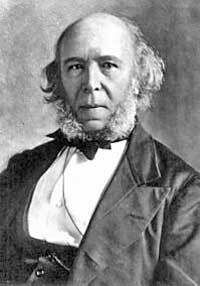 Herbert Spencer, founder of modern sociology, was born in 1820, in Exeter Street, Derby, son of George Spencer and Harriet, daughter of John Holmes of Brailsford and Derby, a glazier and plumber. His father ran a school in Green Lane, Derby, which Herbert attended. He decided not to go to Cambridge, preferring to educate himself in the natural sciences. The family moved to 8 Wilmot St, Derby. He worked as a railway engineer from 1837 to 1841, before, in his early 20's, turning to journalism and political writing. He identified himself with some of the main issues of the day, namely the Chartist movement, slavery and universal sufferage. From 1848 to 1853 he worked as a writer and sub editor for the Economist where he came into contact with a number of intellectual figures including Thomas Carlyle, T.H.Huxley and Mary Ann Evans (George Elliot), with whom he a lengthy intellectual association. In 1851 his 'Social Statics', or the Conditions Essential to Human Happiness appeared in which he argued for an extreme form of economic and social laissez-faire, based on an evolutionary theory. His uncle died in 1853 leaving him a small inheritance which allowed him to devote himself to writing without depending on regular employment. In 1855 he published his second book 'The Principles of Psychology in which he focussed criticisms on Mill's associationism. He then embarked on a more comprehensive work , called A system of Synthetic Philosophy, or First Principles, which provided a systematic account of his views in biology, sociology, ethics and politics. The task took him from 1862 to 1896 to complete. It was initially only available private subscription and as his fame grew with each publication he gained more and more admirer's from both radical thinkers and prominent scientists. In 1873 he started a series of publications called Descriptive Sociology, in which information was provided about the social institutions of various societies, both primative and civilized. The series was eventually to have been comprised of 19 parts but had to be completed by trustees because of his death in 1903, in Brighton.